The AX-Synth is great fun to use, it looks fantastic and the onboard sounds are a welcome addition. We want one! Looks great and feels nicely balanced. Very playable, easy to control and simple to navigate. Onboard sounds are a real bonus and are generally very useable. Expensive. More hardware control would have been nice. Neck a little thick under the touch controller. Roland isn't calling the AX-Synth a keytar, but everyone else is. Roland first entered the keytar market with the SH-101 in 1983 (the mod grip option turned it from a humble monosynth into a keytar). Following this, it released the AX-1 in 1992 and the AX-7 in 2002 (both successful MIDI controller keytars that had no onboard sounds). After discontinuing the AX-7 in 2007, second-hand prices began to rocket - a testament to how popular these products actually are. Face it: keytars are so bad they're good and, in recognition of the need for cheese, Roland has brought it back big style. As keytars go, the AX-Synth a gorgeous beast. It looks great in white, with flowing clean lines and, if you've got the nerve and desire, you WILL stand out on stage. Coupled with neon blue lights on the preset select buttons, it all adds up to a very elegant product (though we have to say it's slightly let down by the plastic that it's fashioned from). There are plenty of connections on the AX-Synth. You get a pair of jack audio outs, a headphone socket, MIDI In and Out, a foot pedal socket and USB/USB MIDI that enables the AX-Synth to communicate with PCs (and hopefully Macs soon). The USB editor will allow editing of the AX's built-in synth sounds on your computer. Once edited, sounds can then be uploaded back to the AX-Synth. This is great, though it would have been even better if there were independent controls for envelopes, filter resonance/cutoff and effect control on the front panel itself. It's a bind that you have to connect to a computer even for these basic duties. However, you can change the reverb send and patch volume levels using Shift+Tone buttons. Power can be supplied to the AX-Synth via the supplied walwart power supply or from eight Ni-MH rechargeable batteries (AA size) or normal AAs. Roland has even included two hooks to stop wires being yanked away when on stage. Strapping on the AX-Synth for the first time is a truly liberating experience. It feels well balanced and everything falls instantly to hand. On the front of the neck are controls for octave up and down, the modulation bar (which feels great for mod duties and fits the hand perfectly) and the touch controller for pitch bending. However, here's our first gripe - the neck is a little thick under the touch controller and it's sometimes hard performing accurate pitch bends. It's also quite a long way to reach round over the top of the mod bar. Not a massive problem, but if you have smaller hands, the AX-Synth might be hard to get to grips with (no pun intended). Next to the mod bar and touch controller are three buttons that assign functionality to the D-Beam infrared controller - a now common device on Roland products. These buttons can control either pitch or filter, or can be assigned to other controller duties as required (volume is a useful assignment here). The D-Beam is always handy to have around and it's a great visual controller, too. The controls extend to the back of the neck, with several important ones under your left thumb. First up are two rotary controllers - one for volume and one for aftertouch. Unfortunately, this aftertouch control is slightly misleading - it doesn't control aftertouch as we know it as the AX-Synth doesn't have an aftertouch keybed (shame). Basically, it's an extra rotary modulation control and acts differently depending on the sound selected. There are three further buttons on the back of the neck for switching on portamento, kicking in the bender mode and activating the hold function. The bender mode is particularly useful on lead guitar type sounds, as it only bends the last note played. Nice. The hold button is almost like a sustain button - you play the note, press hold and it sustains infinitely until you let go, freeing you up to fiddle with the D-Beam and modulation. Keyboard-wise, the AX-Synth has a 49-note, four-octave, velocity-sensitive C to E design (an improvement on the AX-7's 45-note E to C design). It feels good and is playable at most angles, though we found it a little too stiffly sprung and the action sometimes got in the way of faster runs. While on the subject of playability, Roland has made two-handed playing a genuine option via a couple of different places to attach the strap. Another of the AX's clever bits of attention to detail. The front panel of the AX-Synth houses all the internal and external MIDI patch selection buttons, a seven-segment old-school red LED display (same as the AX-7s), transpose buttons and controls for storing 16 of your favourite patches for instant recall (via the A and B favourite buttons). The keyboard also doubles up as a numeric keypad for selecting external MIDI channels (bottom octave) and patch changing (top octave). Patch selecting while playing is a doddle and it's great that the up/down patch selectors have been moved from the neck (on the AX-7) to the front panel. It's much easier stepping through the sounds using your right hand, rather than your left. Perhaps it would have worked a bit better if the front panel had been tilted towards the player more, though, as it's quite hard to see the display panel once you've strapped on. Probably the most important difference between AX-Synth and its AX-series predecessors is the inclusion of the 128-note polyphonic, Fantom G-derived sound engine. It's great to have this onboard as it means that you don't have to connect to external MIDI gear just to make a sound, and you can instantly start playing without any connections. Big hats off to Roland for doing this, though built-in (mini?) speakers would have been a nice bonus. On the whole, the onboard sounds are very playable and very controllable and there's something for every type of player, whether you're into funk, soul, rock or acoustic. There's definitely an emphasis on lead type sounds - lots of synths, guitars and squalling saxes - and while they won't set the world on fire, they are generally good quality, designed to cut through a mix. Highlights include the 'Supernatural' violins, cellos and brass (the mod bar is assigned to expression on several of these sounds). Furthermore, there are some great analogue style basses and leads, huge-sounding polysynths and pads, a couple of nice pianos, organs, clavs, choirs and more. The only thing missing here is front panel control for the effects. We really like the AX-Synth - it delivers the goods on almost every level. The only question mark hanging over it is the price. At over £800 you have to ask yourself how much of that money is going on the onboard synth, and if you really want it. That said, the new feature set and great-looking design makes this a much more complete instrument than previous AX models. 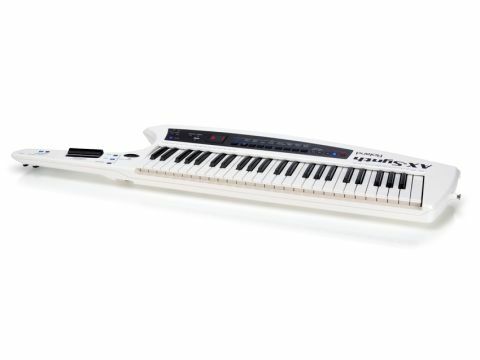 It sounds and looks great and, although it's a tad expensive, it puts Roland firmly back at the top of the keytar tree.